If you are newbie or beginner, you should know the basic knowledge about drivers license, student permits, conductors permits and charges. If you want to know about the basic, you can go to the Land Transportation Office (LTO) in your area and ask for the requirements, fees and charges. If you want to have a drivers license, you should get students permit first before anything else. As a new one, you should know the steps and have the requirements for students permit like birth certificate (NSO certified/aunthenticated) and the fees to pay for. Just have a photocopy or xerox copy of your birth certificate, ID's if necessary. Don't forget to bring money for the fees. 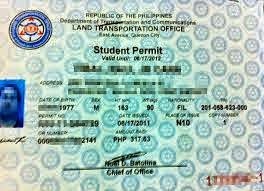 For more information regarding the requirements and qualifications, just visit LTO License Philippines's student permit post here. Always remember that student permits is the only one thing you need to get a pro or non-pro drivers license. Stay tune for more rider's information only here at Rider's Digest.